I remember some time ago seeing a picture of bread that had been baked inside a round dutch oven. I'm a bit short on baking supplies (One loaf pan, one pizza stone) and, quite frankly, very new to baking bread. I have two seed cultures going - one rye, one spelt, but how healthy they will be remains to be seen. In the meantime, I am itching to make some bread! 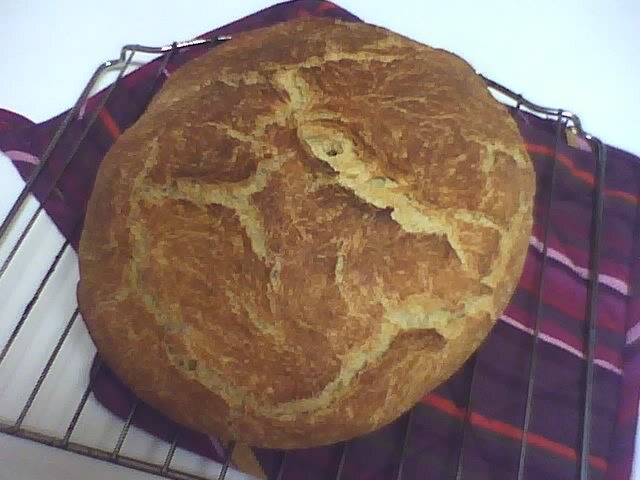 I am interested in doing a one-day bread and cooking it in the dutch oven (I believe I have a 5 quart). I have rye flour, spelt flour, and AP flour available on-hand as well as whole wheat berries, bulgar, quinoa, pearled barley and oats that could all be ground as-needed for anything interesting/unusual. I have bread machine/instant yeast but not regular active dry yeast that you normally add water to. Any suggestions on what to bake? I bake a lot of bread dutch-oven style. 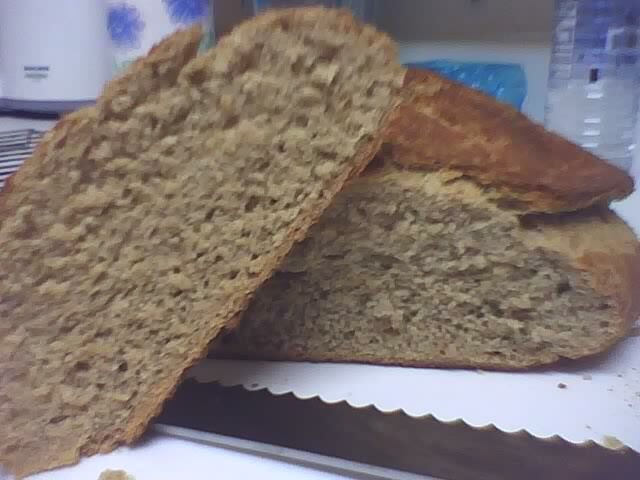 I just baked rye bread in one, even though the recipe does not call for it. Don't be afraid to stray away from the recipe. The loaf came out soft on the inside with a nice crust using this baking method. Follow all the directions but put it in your pot with the lid on for the first 20 min. then bake with the lid off for another 20-25 min. 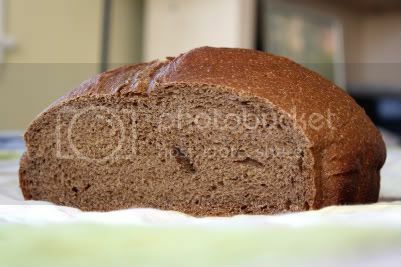 I started looking through the BBA for 1-day breads and found the marbled rye. I don't have dark rye flour, so I'm going to make only the light-rye half of the recipe and toss it into my dutch oven and see what I get! It's in the bowl (WHEW, I forgot how much work hand-kneading was!) waiting to rise right now. It's fairly cool and humid here, so it may take longer than the recipe calls for. Should be ready right around dinner time. I think we're going to have some nummy sandwiches for dinner tonight. Ooooh, it's so pretty and golden brown. A bit 'ragged' on top - it was smooth going in, but it split its crust in a random pattern during the oven spring apparently. It SMELLS like heaven! How in the world am I supposed to wait the recommended 2 hours to cut it! I can't wait to look inside and taste it. I couldn't wait! I barely made it 1 hour before the lure got me. The picture of the crumb is out of focus - such is the downside of camera phone cameras. This site has great instructional videos about baking in dutch ovens. Hope this helps.